This practical financial dictionary for most popular financial terms helps you understand and comprehend most common financial lingo. It was written with an emphasis to quickly grasp the context without using jargon. Each of the financial terms is explained in detail (min. 600 words) and also gives practical examples. This book is useful if you are new to business and finance. 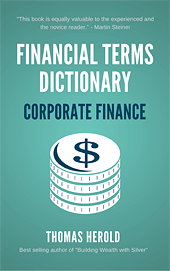 It includes over 800 most frequently used terms for businesses, investors and entrepreneurs. It also covers the lingo that was introduced in the financial crisis of 2008 until 2017. With the alphabetical order it makes it quick and easy to find what you are looking for. 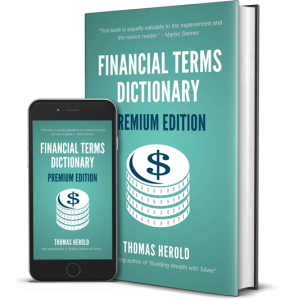 Example Term: What is the Case Shiller Index? The Case Shiller Index represents the collection of United States’ Home Price Indices. These were developed by economists Karl Case and noted Yale Professor Robert Shiller. The two men’s company Case Shiller Weiss, Inc. produced the statistics from 1991-2002. Allan Weiss their partner oversaw the production and release of the index on a regular basis. This index is a collection of house price indicators for where the market has come and currently is. Among the many versions of the Case Shiller Index is the 20 city composite, the 10 city composite, and also twenty metro individual regions. The commercial versions of the Case Shiller Indices data points start in January of 1987 and run to date. CoreLogic has since taken over the production of the index where David Stiff and Linda Ladner assumed direction. There is now a wide variety in this Case Shiller Index because Standard & Poor’s 500 produces and owns a number of them. For example, Standard & Poor’s publishes the Case Shiller twenty cities, condominium indices, high, medium, and low tier home price indices, and the national U.S. index. Anyone who is interested in following them can do so on the S&P company website. Eleven of the various S&P produced indices can be traded as futures on the Chicago Mercantile Exchange. Standard and Poor’s set their value to a level of 100 for the prices based in January 2000. Robert Shiller and Karl Case calculated the original Case Shiller Index on a different basis. Their index gathered home price data back to 1890. In their calculations, the 100 value was based on the house prices for the index in 1890. Robert Shiller’s version of the index on his website comes out quarterly. His calculations are probably different than the ones Standard and Poor’s uses as is his reference point. This is why in 2013 for the fourth quarter, the S&P 20 city index showed in the 160s, while the same point for Robert Shiller’s data was in the 130s. Professor Shiller wrote and published a book in 2000 about the housing market called Irrational Exuberance. In this book, he made the statement that no other country in the world seems to have published this type of housing data going back to the 1890s. There are some important economic inferences that the Case Shiller Index shows. Shiller also detailed these in his book. He insists the idea that housing prices have been in a continuing uptrend over time in the United States is false. Instead, the prices of houses have a powerful tendency to go back towards their levels in 1890 as adjusted for inflation. He also notes that there is no correlation between changing home price patterns and the changes in population levels, interest rates, or even construction costs. The Case Shiller Index also gives Shiller enough information to explain why there is no constant uptrend in the inflation adjusted home prices. Part of this is mobility. He has stated that if the prices of houses rise enough then people can simply move to another area of the country. This is because urban land makes up less than 3% of the U.S. total land area. Improvements in technology are another reason Shiller has discussed for this phenomenon. As technology of home construction has consistently improved, it has become quicker and less expensive to build houses. This keeps a lid on the inflation adjusted cost of homes. Between these reasons, Shiller argues that there is no trend in home prices either up or down. He has observed this not only in the United States, but also in other countries. The real house price indices of Norway and the Netherlands show the same truth.